Gregory Estate Land & Water Right Auction, Sterling, Colo., (970) 522-7770, (800) 748-2589 or http://www.ReckAgri.com. Consignment Auction, Brush, Colo., (970) 842-5575 or http://www.AMA-Auctions.com. Online Only Unreserved Auction, (800) 937-3558 or http://www.StockRa.com. Consignment Auction, Bailey, Colo., (303) 838-7944 or http://www.KenoshAauctionInc.com. Internet Auction, Denver, Colo., (866) 515-1668 or http://www.RollerAuction.com. Misc Merchandise Auction, Henderson, Colo., (303) 934-8822 or http://www.Dickensheet.com. Public Auction, Thornton, Colo., (303) 934-8322 or http://www.DickenSheet.com. Bullock Liquidation Auction, Torrington, Wyo., (307) 631-0078 or http://www.DoubleDAuctionsLLC.com. Misc. Estates/Consignment Auction, Byers, Colo., (303) 822-9298 or http://www.LinneburAuctions.com. 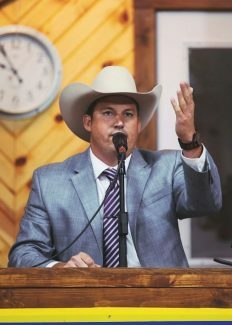 Hay Auction, Ft. Collins, Colo., (970) 482-6207 or http://www.CLAAuction.com. Witt Living Auction, Parker, Colo., (303) 633-7491 or http://www.EllenbergerAuctions.com. Frahm Construction Going Out of Business/Moving Auction, Elizabeth, Colo., (970) 785-6282 or http://www.TroyerAuctions.com. Helser Auction, Scottsbluff, Neb., (308) 436-4056 or http://www.HelbergNussAuction.com. Farm Auction, Fowler, Colo., (719) 254-6656, (719) 263-4222 or http://www.MaiersAuctionBarn.com, http://www.JakeNortonRealty.com. Sims Estate Auction, Cheyenne, Wyo., (307) 631-0078, (307) 632-4325 or http://www.DoubleDAuctionsInc.com. Schnitker Sheetrock Liquidation Auction, Laramie, Wyo., (307) 745-5815 or http://www.WestbrookAndsons.com. Antique & Gun Auction, Torrington, Wyo., (307) 837-0150 or http://www.DyersAuction.com. Harris Farm Equipment Auction, Platteville, Colo., (970) 356-3943 or http://www.K-WAuctions.com. Ft. Lupton Public Estate Auction, Ft. Lupton, Colo., (720) 685-9400 or http://www.AmericanAuctionsLLC.com. Antique, Gun & Artifacts Auction, Rawlins, Wyo., (307) 324-3710 or http://www.WoodwardAuctions.com. Kelling Estate Auction, Moah, Utah, (970) 260-5577 or http://www.CPAuction.com. Martinez Auction, Julesburg, Colo., (970) 474-3693, (970) 520-5257 or http://www.MichaelAuction.com. Niwot Antique Auction, Longmont, Colo., (303) 589-4119 or http://www.NiwotAuction.com. Public Auction, Henderson, Colo., (970) 356-2998. Estep Masonry Liquidation Auction, LaJunta, Colo., (719) 336-5117, (719) 940-5117 or http://www.CivisAuctions.com. Master Lease Internet Auction, (866) 515-1668 or http://www.rollerAuction.com. Stecher Auction, Potter, Neb., (308) 879-4557 or http://www.FarmAuction.net. Rocky Mountain Rubber Mfg. Internet Auction, Denver, Colo., (866) 515-1668 or http://www.RollerAuction.com. Big Iron Online Equipment Auction, (800) 937-3558 or http://www.StockRa.com,. http://www.BigIron.com. .
CO Draft Horse & Equipment Auction, Henderson, Colo., (970) 785-6282 or http://www.TroyerAuctions.com. Stengel Estate Auction, Boulder, Colo., (303) 589-4119, (970) 215-3440 or http://www.NiwotAuction.com. Sandy Bowman Tool & Vehicle Auction, Wray, Colo., 970-774-4500, (970) 854-4400 or http://www.Knode-RealtyAuction.com. Weiser Moving Auction, Wiggins, Colo., (970) 842-5575 or http://www.AMA-Auctions.com. Kiowa Lyons Club Consignment Auction, Kiowa, Colo., (303) 633-7491 or http://www.EllenbergerAuctions.com. Hoagland Estate Auction, Minatare, Neb., (308) 436-4056 or http://www.HelbergNussAuction.com. All American Homes Inventory Reduction Auction, Milliken, Colo., (970) 356-3943 or http://www.K-WAuctions.com. Hellwig Farms Dispersion Auction, Torrington, Wyo., (307) 532-4976, (307) 534-5156 or http://www.McNameeBrothersAuctions.com. Wisdom Household Auction, Sutherland, Neb., (308) 386-6125 or http://www.SchowAuction.com. Open Consignment Machinery, Vehicle & Equipment Auction, Ft. Collins, Colo., (970) 482-6207 or http://www.CLAAuction.com. Zarbock Estate Auction, Loveland, Colo., (970) 396-8754 or http://www.NixonAuctions.com. Doll Equipment Auction, Greeley, Colo., (970) 842-5575 or http://www.AMA-Auctions.com. Carpenter Community Consignment Auction, Carpenter, Wyo., (307) 635-1995. Ferguson Moving/Ranch Auction, Elbert, Colo., (303) 822-9298 or http://www.LinneburAuctions.com. Hay Auction, Greeley, Colo., (970) 302-0018. Consignment Auction, Castle Rock, Colo., (303) 633-7491 or http://www.EllenbergerAuctions.com. Indian Arts & Crafts Auction, Longmont, Colo., (303) 589-4119 or (505) 320-6445. Online Equipment Auction, Boulder, Colo., (303) 589-4119, (970) 215-3440 or http://www.NiwotAuction.com. Hickey Estate Land Auction, Scottsbluff, Neb., (308) 262-1150 or http://www.Farmauction.net. Bill Poulson Estate Auction, Commerce City, Colo., (303) 589-4119, (970) 215-3440 or http://www.NiwotAuction.com. Auto Auction Auction, Loveland, Colo., (970) 266-9561 or http://www.SAAASInc.com. Antique Auction, Longmont, Colo., (303) 589-4119 or http://www.NiwotAuction.com. WHB Fall Equipment Consignment & Hay Auction, Burns, Wyo., (307) 635-1995. Skip & Lynda Higgins Public Auction, Keenesburg, Colo., (303) 822-9298 or http://www.LinneburAuctions.com. Fall Equipment & Hay Auction, Burns, Wyo., (307) 703-4020 or http://www.WHBVideoAuctions.com. Bill Poulson Online Estate Auction, Commerce City, Colo., (303) 589-4119, (970) 215-3440 or http://www.NiwotAuction.com. Dalrymple Farm Equipment Dispersal Auction, Bennett, Colo., (303) 822-9298 or http://www.LinneburAuctions.com. Consignment Auction, Castle Rock, Colo., (303) 633-7491 or http://www.EllenbergerAuctions.com. McIntosh Moving/Farm Auction, Keenesburg, Colo., (303) 822-9298 or http://www.LinneburAuctions.com.